Daleys Fruit Tree has Plants for Sale to Isle Of Capri and can Mail Order them to you door. Click to Find out how much Freight Will Cost. A highly ornamental shrub with spreading branches and aromatic foliage. 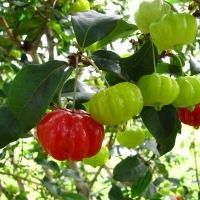 The Brazilian cherry has delicate white flowers that are followed within 3 weeks by a ribbed fruit that changes from green to orange to maroon-red when fully ripe. The young bronze foliage turns a glossy deep green when mature and deep red in cold, dry weather. The fruit is delicious eaten out-of-hand or as an ingredient in jelly, sauce and pies. Refrigeration enhances the flavour and makes these a good substitute for strawberries. Weed warning: This tasty and very hardy pumpkin shaped berry is popular as a kids treat. 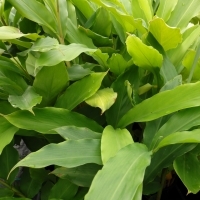 Cardamon ginger is a leafy ginger-like plant that grows in clumps and makes an excellent low screen, it adds a tropical feel to any garden. While the seeds don't resemble true cardamon the leaves can be used in desserts, to add flavour when steaming rice or used to wrap fish. Leaves are also delicious when infused to make spiced tea's, infuse one cardamon leaf, two sticks of lemon grass and one chopped chilli for a winter warmer. Red fruited cutting grown selection. The fruit contains an acid juice similar to that of a lime. A delicate rainforest tree that offers a distinctive citrus flavour to sweet or savoury dishes. The juicy cells, similar in appearance to caviar, are a delightful surprise in salad dressings. A rainforest tree that naturally occurs as an understorey tree in SE Queensland and Northern NSW. Red fruited variety, these hybrid trees are either male or female, plant two or more to increase your chances of have one of each.